We start our inspection as soon as we pull up to your property. We visually start inspecting the house and grounds looking for any problems or areas of concern. We typically start by climbing your roof and inspecting shingles, flashing, windows, trim, sills, caulking and plumbing vents. Many times we find Ice & Water shield missing which is required by code for all newer buildings. We continue our exterior inspection on the ground and encompass the landscaping, drainage and exterior of the home. On the interior we start in the basement and work our way through the house up to the attic. All defect pictures and deficiencies are included in a easy to read computerize report. At the conclusion of the inspection we review all deficiencies while at the property. We explain all defects and recommended solutions prior to leaving the property. Your computerized report includes a PDF copy of the report for ease of transmission or just for your records. Orillia Home Inspections provides their customers with a guaranteed home inspection. If for any reason the customer is not happy their money is cheerfully refunded. 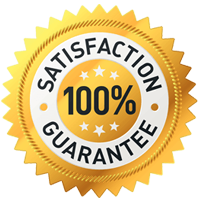 Our business is based on providing exceptional service to our customers and we are willing to stand behind that statement by offering this guarantee. The “Orillia Home Inspector” also offers our “Pricing Policy” which permits our customers to know exactly what our inspection fee is prior to contacting us.